Online services from Travel In Prince Edward Island will help you with promotion and book new online customers. PEI has so much to offer. Make sure to share your stories. Did you know that the meetings to start Canada on the road to becoming a country were held in Charlottetown? Click here to book from a selection of Charlottetown hotels. This capital city, first incorporated as a town in 1855, now is home to about 58,625 people which is just over two-fifths of PEI's population. Fittingly, its economy is based on government, healthcare and education, with increasing numbers of light manufacturing, call centres, and technology companies. Charlottetown offers visitors both historic and cultural attractions. 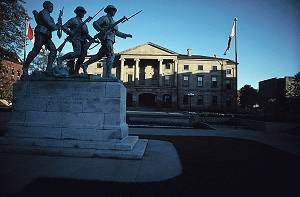 As host of the Charlottetown Conference and Canada's second oldest seat of government, Province House is nicknamed the Birthplace of Confederation and is a National Historic Site of Canada. Several war memorial monuments can be found near Province House. Founders Hall features an interactive Time Travel Tunnel display of Canada's development as a nation. The PEI Museum and Heritage Foundation can be found at Beaconsfield Historic House, built in 1877 and open for tours. View more of Charlottetown's history illustrated on eight interpretive panels along the city's scenic waterfront boardwalk that includes parks, shops and restaurants. Or stroll past Victorian-era houses and buildings downtown. Live theatre beckons at the Confederation Centre of the Arts, and the summertime Charlottetown Festival features the ever popular Anne of Green Gables - The Musical. Cruising the nearby rivers in summer offers sightings of marine life and more historic sites. Harness racing, slot machines, and poker tables can be found at the Charlottetown Driving Park Entertainment Centre, and you can stay for dinner. We are conveniently located near the University of Prince Edward Island, the Shops of the Confederation Court Mall, the Confederation Centre of the Arts (Centre des arts de la Confédération) and the Charlottetown Airport. We are ideally located in the heart of Charlottetown's shopping district, close to downtown core and the airport. Offering a variety of accommodations to meet the needs and budget of any guest. We feature regular guest rooms, kitchenettes, and suites, with convenient drive-up parking. Guests are treated to our delicious free daily continental breakfast. Prince Edward Island is Canada's smallest province at 224 kilometers long. The birthplace of Confederation and Canada's most famous redhead, Anne of Green Gables, this tiny island is action-packed. We are conveniently located close to most major attractions and business. This Charlottetown hotel is minutes from the Confederation Centre of the Arts, the University of Prince Edward Island, the Charlottetown Yacht Club, the Green Gables Heritage Place, Holland College and Cavendish Beach. The Hotel on Pownal in Charlottetown proudly provides 45 guest rooms and suites, each with their own modern urban touches. From free parking for all our guests, wireless high-speed internet, deluxe continental breakfast, all the way to freshly baked cookies every afternoon, we pride ourselves in offering a distinct hotel experience like no other on Prince Edward Island. Let Prince Edward Island's Howard Johnson Hotel be your home away from home! This hotel is conveniently located in tranquil rural surroundings yet only 10 minutes from the Downtown core of Charlottetown. Abegweit Tourist Home B&B Charlottetown 19 Blythe Cres. Aber Cae Cottage Long Term Charlottetown 28 MacKay Dr.
Alluring Waterfront Bed & Breakfast B&B Charlottetown 22 Lewis Cres. Aloha Tourist Home B&B Charlottetown 234 Sydney St.
Amherst Cove Shoreline Beach House Long Term Charlottetown 96 Wally's Lane. Bagnall's Heritage Inn B&B Charlottetown 193 Prince St.
Brighton Tourist Apartments Long Term Charlottetown 28 Brighton Rd. Brunswick View Cottage Long Term Charlottetown 80 Linkview Cres.